As I entered the empty house at the Metropolitan Opera and walked down the aisle, I was hit with sudden pangs of tense anxiety and adrenaline when I saw them. There was the lighting board and stage manager’s station set up in the middle of the orchestra. Only now it is, of course, a lighting computer. I haven’t directed a play for almost 20 years, but in an instant I was reflexively steeling myself for the exhaustion of techs and dress. Without realizing why, I was compelled to walk back out and get a cup of coffee from the hoity concession stand for $5. But really, it was very good coffee. I quipped that I would probably start having the dreams again too. And sure enough, I had the endless tech rehearsal disaster dream last night. 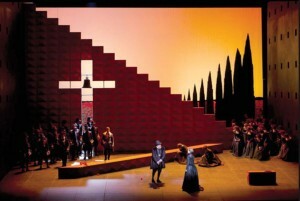 They’ve used these sets for some years now, but it takes a long time for hardliners to except change at the Met as anything but heretical. I thought Bob Crowley’s designs were effective and quite clever, with a touch of Max Reinhardt about some of them, even if I also wonder what the Met’s grand old ultra-realistic sets might have been like. I must confess, some relief came from knowing I had not the responsibility of making sure none those many performers bumped into the furniture. Tickets for Verdi’s Don Carlo start at $27, with 8 performances beginning March 30, through April 25. Yannick Nézet-Séguin conductor, Nicholas Hytner production. Starring Carlo Yonghoon Lee and Barbara Frittoli, with Ekaterina Gubanova, James Morris, and Ferruccio Furlanetto reprising his portrayal of King Philip, and a One Man’s World special mention for the charismatic baritone Dmitri Hvorostovsky singing the role of the Marquis de Posa.